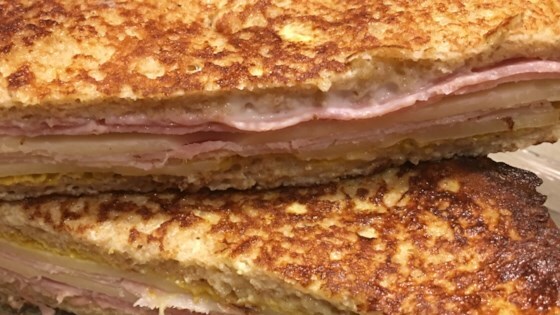 "A quick and easy sandwich with ham, turkey and swiss slices, dipped in an egg/milk mixture and fried to a golden brown. A hot alternative to the usual lunch or snack. Try it with berry jam on the side." Spread bread with mayonnaise and mustard. Alternate ham, Swiss and turkey slices on bread. Beat egg and milk in a small bowl. Coat the sandwich with the egg and milk mixture. Heat a greased skillet over medium heat, brown the sandwich on both sides. Serve hot. The ultimate deep-fried ham and cheese sandwich!